Fischer, Sasse, Bacon, Smith and Fortenberry are all using family farms and family leave as political cover for giving a Christmas handout to big corporations and Wall Street. Find a candidate on our page and volunteer to help get them elected. Become a monthly donor–our goal is to hit 200 donors and we are at 191! Sign up to be Block and Precinct Captain for 2018. We will train you, give you materials and connect you with other volunteers. Sign up now and early next year we will be in touch with all the details to elect Democrats across Nebraska. Deb Fischer’s celebrated “family leave” does nothing to make paid leave a law. All it does is nudge businesses to do the right thing and offers them–yet again–another tax cut if they do. Reality is states are leading on this and Fischer is pretending to be a leader. 55,000 kids on CHIP in Nebraska still have NO PATH to ensure their insurance is funded. So while Deb Fischer takes selfies at the White House, moms and dads are terrified their kids getting cancer treatment will not have anywhere to turn. Yes, families will get some money back and that is a great thing–but as with everything the Trump Republicans are doing these days, it comes with a catch. Other tax deductions middle-class families used are going away and the tax cuts for middle and working class families expire while all the HUGE tax cuts for the wealthy remain. Big banks and corporations would be big winners under the Republican tax plan. CEOs continue to say that they will use massive corporate tax cuts to benefit wealthy shareholders, not to create jobs or raise wages. The Republican tax bill could even encourage corporations to cut jobs or move them overseas. The Republican tax bill could encourage companies to actually cut jobs, not add them. The Republican tax bill creates a huge pass-through loophole that benefits the rich. Republicans have tried to claim their tax bill helps middle-class families with changes to child tax credits and other deductions, but these changes are small and only temporary. 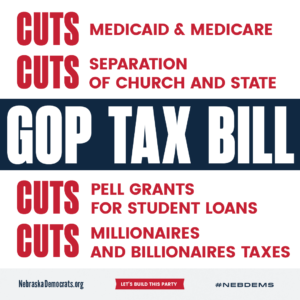 The Republican tax bill benefits corporations and the richest Americans – who get massive tax cuts — more than the middle class. Tax cuts for middle-class families in the Republican tax bill expire, leaving many households left to pay more than they do now. The Republican tax bill repeals the individual mandate and would result in 13 million fewer people having health insurance. The Republican tax bill increases the deficit by nearly $1.5 trillion, and Republicans will use that as an excuse to slash funding for critical programs that would hit lower-income families the hardest. Trump and his family would still benefit a lot from changes in the Republican tax plan, but we can’t know exactly how much until he releases his tax returns.